G.O.Ms.No.91, FINANCE (HRM.IV) DEPARTMENT Dated: 23-05-2017. 1.G.O.Ms.No.25, Finance (HRM.IV) Department, dated: 18-03-2015. 1. 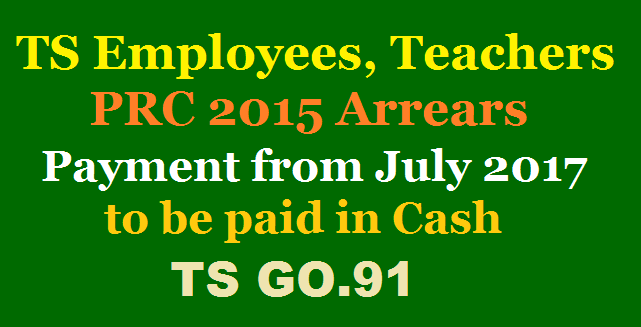 In the Government order 1st read above, orders were issued implementing the Revised Pay Scales, 2015 w.e.f. 01.07.2013, allowing monetary benefit w.e.f. 02.06.2014 and cash payment from the month of March 2015. Regarding the arrears of salary from 02.06.2014 to 28.02.2015, it was ordered that the orders would be issued separately.